The aim of this work was to investigate the effect of exogenous sugars on the extent to which starch synthesis in potato (Solanum tuberosum L.) is controlled by adenosine 5′-diphosphoglucose pyrophosphorylase (EC 2.7.7.27; AGPase). Tuber discs were incubated in the presence of a range of concentrations of glucose and sucrose, and metabolic fluxes measured following the supply of [U-14C]glucose and measurement of the specific radioactivity of the hexose phosphate pool. In the presence of glucose there was a marked increase in the flux through glucose-phosphorylating hexokinase, and at high concentrations of external glucose this led to a stimulation of the rate of starch and sucrose synthesis relative to those measured in the presence of sucrose. In the presence of glucose the ratio of the rate of starch synthesis to the rate of glycolysis was higher than in the presence of sucrose. Similar effects of glucose were observed at two stages of tuber development. We conclude that the presence of glucose perturbs the carbohydrate metabolism of tuber discs so that starch synthesis is favoured. 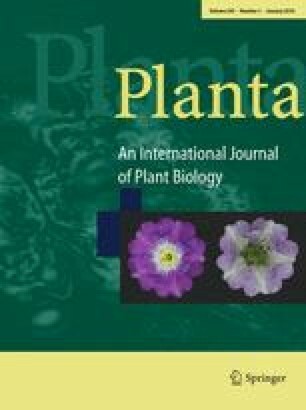 In order to determine the extent to which AGPase controls flux, we measured fluxes in wild-type plants and transgenic plants with reduced AGPase activity as a result of the expression of a cDNA encoding the B subunit in the antisense orientation. In the presence of sucrose a reduction in AGPase activity had a greater impact on the rate of starch synthesis than in the presence of glucose. The flux control coefficient of AGPase over starch synthesis was higher in the presence of sucrose (0.7–0.9) than in the presence of glucose (0.4–0.6). Conversely, the impact of reduced AGPase activity on the rate of sucrose synthesis was lower in the presence of sucrose than glucose. In the presence of 200 mM sucrose the flux control coefficient of AGPase over the rate of sucrose synthesis was not significantly different from zero. This demonstrates that the nature of the sugar supplied to potato tuber discs can have a major influence on the distribution of control within metabolism. These data were also used to investigate the relationship between demand for ATP and the rate of hexose phosphate entry into glycolysis. A very strong correlation between ATP demand and glycolytic flux was demonstrated.